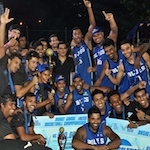 David Peiris Motor Company Sports Club of Sri Lanka will conduct the fifth successive ‘Nature Cup’ Invitation All Island men’s and women’s Basketball Championships 2006 at their sports complex in Madapatha from June 3. The men’s and women’s badminton segment will not be conducted this year. Nine men’s teams and five women’s have accepted the DPMC invitation. A notable absentee this year will be Seylan Bank, last year’s men’s runners-up and women’s champions. The men’s tournament will be conducted on a round-robin basis. The nine teams pooled into two groups, with the first two teams of each group qualifying for the semi finals at the completion of the league. The teams: Group ‘A’ – Ranawana and Company, Kurunegala BC, Colombo International School and David Peiris Motor Company. Group ‘B’ – Dialog Telekom (defending champions), MAS Holdings, DFCC Vardana Bank, SriLankan Airlines and Red Devils BC. The women’s tournament will be conducted on a single group round-robin basis, with the first two teams qualifying for the final at the completion of the league. The teams: St. Paul’s Girls School, Milagiriya, SriLankan Airlines, Good Speherd Convent, Kotahema, MAS Holding and David Peiris Motor Company (last years runners-up). Thirty matches are scheduled to be played in the two tournaments. Twenty will be played at the DPMC courts at Madapatha from June 6 to 25 and the other ten will be worked off at the Depot Police Courts from July 6 to 22. The tournaments are being sponsored by Cherry QQ. The above was revealed at a media briefing held on Friday, May 26 at the MCA with the association of DPMC officials – Neil Perera (executive director), Hiranga Mohotti (GB Human Resources and President Sports Club, Laksiri Peiris (service manager and secretary SC), Deeptha Ekanayake (manager financial services and treasurer SC) and Tudor Perers (operations manager and executive committee SC).